Recognizes a protein of 30-33kDa, which is identified as CD20. 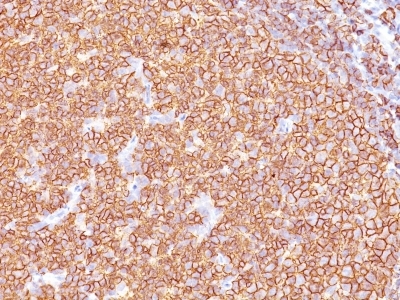 It is a non-Ig differentiation antigen of B-cells and its expression is restricted to normal and neoplastic B-cells, being absent from all other leukocytes and tissues. CD20 is expressed by pre B-cells and persists during all stages of B-cell maturation but is lost upon terminal differentiation into plasma cells. This MAb can be used for immunophenotyping of leukemia and malignant cells, B lymphocyte detection in peripheral blood and B cell localization in tissues. It reacts with the majority of B-cells present in peripheral blood and lymphoid tissues and their derived lymphomas. In lymphoid tissue, germinal center blasts and B-immunoblasts are particularly reactive. It is a reliable antibody for ascribing a B-cell phenotype in known lymphoid tissues. Rarely, CD20-positive T-cell lymphomas have been reported. Reactivity has also been noted with Reed-Sternberg cells in cases of Hodgkin's disease, particularly of lymphocyte predominant type. Daudi, Raji, and U266, and human lymphocytes. Lymph nodes and tonsils. Small volumes of anti-MS4A1 antibody vial(s) may occasionally become entrapped in the seal of the product vial during shipment and storage. If necessary, briefly centrifuge the vial on a tabletop centrifuge to dislodge any liquid in the container`s cap. Certain products may require to ship with dry ice and additional dry ice fee may apply. NCBI/Uniprot data below describe general gene information for MS4A1. It may not necessarily be applicable to this product. MS4A1: This protein may be involved in the regulation of B-cell activation and proliferation. Defects in MS4A1 are the cause of immunodeficiency common variable type 5 (CVID5); also called antibody deficiency due to CD20 defect. CVID5 is a primary immunodeficiency characterized by antibody deficiency, hypogammaglobulinemia, recurrent bacterial infections and an inability to mount an antibody response to antigen. The defect results from a failure of B-cell differentiation and impaired secretion of immunoglobulins; the numbers of circulating B-cells is usually in the normal range, but can be low. Belongs to the MS4A family. 1. Case Report: aberrant CD20 expression by skin-infiltrating T cells using multispectral imaging.